Breng de inlaws! Apart appartement perfect voor een uitgebreid gezin. Aparte begane grond appartement met 2 slaapkamers / suite maakt private ruimte uitgerust met 47 "plasma-tv, King size slaapkamer en een extra slaapkamer. Ook heeft zijn eigen eethoek en een kitchenette. Deze accommodatie heeft geen golfkar. Golfkar verhuurbedrijven zullen worden aanbevolen door de eigenaar. Restitutiebeleid - volledige restitutie wordt 30 dagen voor aankomstdatum gegeven. Na die datum wordt een terugbetaling alleen gegeven als de eigenaar in staat is om de accommodatie opnieuw te boeken. Deze ruime, Low Country woning is gelegen aan een rustige straat op slechts vier minuten lopen naar het centrum toegang eiland strand ... een minuut op de fiets. Veranda en uitzicht vanuit elke kamer maakt het licht en weelderige landschap een deel van de WOW-factor! De ruime woonkamer biedt comfortabele stoelen voor onderhoudend, en de eetkamer biedt plaats acht met overloop naar de afgeschermde veranda. De grote, lichte, open volledig ingerichte keuken beschikt over 30 voet van aanrecht - ideaal voor meerdere chefs en een buffet. Twee van de slaapkamers hebben directe toegang tot de portieken. Boven baden zijn volledig betegeld met bad / douche combinaties, in-law suite badkamer is gerenoveerd en voorzien van betegelde douche. Aparte wasmachine / droger ruimte. Huisdieren zijn niet toegestaan ​​en niet roken. Off-straat parkeren herbergt meerdere voertuigen - zelfs een plaats voor de boot! Het beste van alles, Fripp Island is een wildreservaat, en herten zwerven regelmatig onze voor- en achterkant. Nog beter, is Fripp Island vaak bezocht door Loggerhead zeeschildpadden nestelen op onze kusten. Trefwoorden: 'Summer Hours' .Attached appartement, grote keuken, bijgewerkt, kingsize bedden, scherm veranda, lopen naar het strand, Golf Cart, voorziening kaarten. Fripp is a wonderful place for a quiet and peaceful vacation. We had a few issues with our golf cart however. First of all the cart we had reserved (a month prior to our trip) from CCC was NEVER delivered. With 10 people, we really needed 2. The first few days required several back and forth trips to the beach. CCC continually promised to deliver the cart but never did. After almost 3 full days the home owner did have a cart delivered from another company. We just lost out on those 3 days. I would never consider using CCC and after reading their reviews I understand others had the same issue. On the first full day of having a second golf cart, one was taken while we were at the pool! I reported it to security and the homeowner. We were never contacted by security or given help resolving the issue. We were told it is a very common occurrence since the carts look alike and are all keyed the same. Still no help when you are left without a cart. We found what we thought was our cart later that evening at the pool so we did finally have a second cart but not because of help from security. We 'marked" our cart by leaving a ribbon tided to it. I would recommend marking your cart if you rent one. Take bug spray too! Mosquitoes are savage! Several were even in the downstairs apartment shower. We will return to Fripp in the future only this time we will be better prepared for these type of mishaps. You don't want to spend vacation dealing with any issues but Fripp is wonderful! I stayed at this home in July 2016 with four generations of family members. My dad celebrated his 85th birthday during our stay and enjoyed time at the beach with his 3- and 5-year old great-grandsons. The separate apartment was the perfect layout for my parents to escape from the very active main house and be able to come and go without help with stairs. The apartment has a flat screen TV, large stainless steel refrigerator, microwave, and coffee maker. The main house is laid out well with lots of space to spread out, and a kitchen that accommodated daily extensive dinners. The bedrooms and baths are large and well appointed. The beds are very comfortable, and plenty of blankets and extra pillows are stored in the large closets. The house is centrally located in a quiet neighborhood. A short walk/golf cart ride to the pools, bar, and restaurant and a three-minute golf cart ride to beach access on Rock Beauty Road. The yard is gorgeous - full of natural plants and beautiful trees which keep the extensive porches shady and cool. We spotted deer and raccoons, and some beautiful red tanagers in the trees in the backyard. Save the space in your car for the trip to Fripp - you won't need beach towels, toys, or chairs - there are plenty stowed in the large outdoor storage locker. The complimentary golf cart was a nice addition - we rented a second one for our parents - and helped keep costs down. I highly recommend this home for your Fripp vacation. Thanks to the owners for sharing your home with us - we will be back! Thank you for sharing your beautiful home! I stayed there many years ago and the renovations are beautiful! We were there with 4 couples and it was perfect! The downstairs apartment was great--I can't wait to go back and take my elderly relatives--this apartment will make things so much easier for them. The kitchen was well stocked and made cooking so easy. There were plenty of towels and extra sheets and blankets and the golf cart was a big bonus. Thank you again for sharing. Our family of 9 and three kids (6m, 2yr. & 5) just gor back from our fabulous annual beach trip. 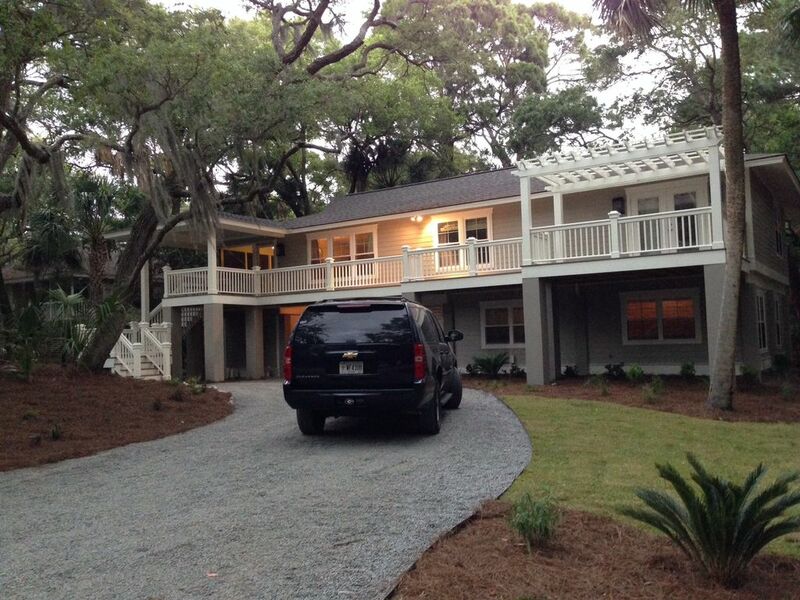 This was our first time staying in this house and visiting Fripp Island. Both were FABULOUS! The house was very spacious and having the 2 TV's were a plus when football games were on and the kiddos wanted to watch cartoons. The golf cart was a blessing for carting all the beach gear and little ones to the beach. The location was close to everything but still on a nice and quiet street with little traffic. We cooked all meals at the house and the kitchen was fully stocked with plenty of plates, pots, pans, platters and silverware. All beds were very comfortable which led to plenty of rest to tackle the next morning! I can't wait enough great things about this house and Fripp Island. We are looking forward to renting this house again! Two Mothers and 5 teenage girls on spring break. The house was perfect the girls had their own apartment and we had a lovely home. Perfect house for a group or 2 families. Very clean and updated and nicely decorated. I'm telling all my friends what a great find. We love Fripp Island!